Leadbeater’s Possums were first discovered at Yellingbo Nature Conservation Reserve (NCR) in 1989. Bird observers visiting the park accidently stumbled upon Leadbeater’s Possums denning in bird watching shelters provided by the group. Yellingbo NCR is a small strip of land which hosts both Victoria’s mammal emblem the Leadbeater’s Possum and its bird emblem, the Helmeted Honeyeater. Yellingbo NCR is a relatively small and isolated Reserve surrounded by private properties, many of which are farming land. The Friends of Helmeted Honeyeater have worked hard since 1989 to revegetate both the Yellingbo NCR and surrounding private land to increase the area and quality of bushland habitat and develop better forest connections for wildlife movement. The Friends of Leadbeater’s Possum also undertake annual revegetation works. As the reserve has not been disturbed by a major event like bushfire for many years the habitat quality is aging, particularly overstorey trees are falling and not being replaced. Due to thick understorey (of grasses, rushes and sedges) the regeneration of these overstorey trees, particularly the Mountain Swamp Gum – Eucalyptus camphora is minimal. Leadbeater’s Possums here rely on large Mountain Swamp Gums for hollow availability (nesting) and as structure enabling movement through the canopy in search of food. Volunteers planting at Yellingbo NCR. May 2009. In May 2009 approximately 1000 plants were planted by 20 volunteers. In May 2010, 600 Mountain Swamp Gums were planted by 13 volunteers. 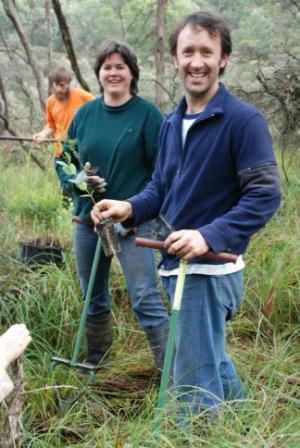 In May and June 2012, 1,000 Mountain Swamp Gum and almost 1,000 other mid storey plants were planted by 41 volunteers.